The gray granite statue is said to be one of the world’s largest of Martin Luther, weighing in at 14,000 lbs. and 12-feet tall. The figure is wearing an academic gown and scholars cap circa the 16th century. Luther is holding a book against his chest with his proper left hand. The right hand is at waist level holding a partially unrolled scroll and his head is tilted slightly upward towards his left. The statue stands on a red brick base with a concrete top and recessed lighting. Granite statue on a concrete and brick base. The statue was a gift from Charlotte philanthropist Irwin Belk, who previously donated nine bronze statues of athletes to Lenoir-Rhyne University. 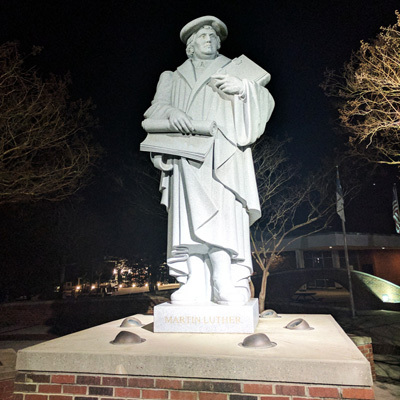 As a priest and theological professor, Luther confronted Roman Catholic doctrine with his “Ninety-Five Theses” in 1517, resulting in his excommunication four years later. His translation of the Bible into the language of the people instead of Latin made it more accessible. His teaching launched the Protestant Reformation, profoundly influenced German culture and created the Lutheran Church. The statue stands in front of Grace Chapel on the campus of Lenoir-Rhyne University, at 625 7th Ave NE, Hickory, NC 28601. The statue stands on the front lawn of the church, surrounded by flowers and seasonal plants.